GASTRONOMY by Joy: OMG! It's Kenny Rogers Roasters' OMG Unfried Fried Chicken! According to the Harvard University School of Public Health, those who eat a lot of foods fried in oil are at a higher risk of type 2 diabetes and heart disease. Oh my gawd! I know, right? 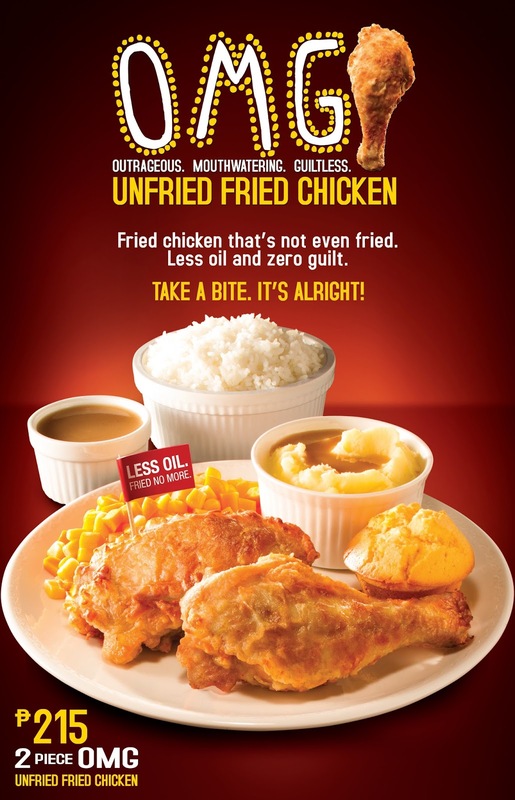 Kenny Rogers Roasters’ OMG Unfried Fried Chicken is here—an outrageously mouthwatering, guiltless treat for those who just can’t give up on the wonders of fried chicken. This new innovation is next-level fried chicken: juicier, more delicious, crispier, and all without deep-frying. I stand witness to this as I was one of the invited bloggers to check out their kitchen and one of the few to try it first! To protect their rights on the #unfriedfried chicken tecnology, we were forbidden to take photos of their kitchen. However, one of their staff demonstrated how OMG was prepared before putting inside their air fryer. TADAH! There's your keyword right there. So why do you think I'm happy with the new OMG Unfried Fried Chicken? 1. It is not fried anymore, thus less oil. The OMG Unfried Fried Chicken, unlike most fried chicken products in the market, is not deep-fried, but rather, cooked through circulating hot air. The result: the skin is still crispy, the meat is juicier with the chicken’s natural oil, and there’s no excess oil used in the cooking process. It’s pure fried chicken goodness minus the health-endangering oil and deep-frying! 2. Deliciousness without the guilt. Great flavors don’t have to mean feeling guilty hours after a heavy meal. With the OMG Unfried Fried Chicken, even the health-conscious can partake in fried chicken indulgence since there’s only pure flavor with every protein-packed bite. Less oil and zero guilt! 3. It’s perfect with amazingly healthy sides. Fried chicken without tasty sides is just sad—at Kenny Rogers Roasters, it’s easy to complete the dining experience with a variety of healthy, freshly cooked sides, such as steamed vegetables, corn and carrots, salads, and more. For only P215.00, customers can get 2 pcs. of OMG Unfried Fried Chicken with 2 regular side dishes, white rice, and a muffin. Healthy, balanced meal! 4. It’s perfect for sharing. Why not share the deliciously healthy love with the entire family, office, or barkada? The OMG Unfried Fried Chicken comes in a Group Meal with eight perfectly unfried fried chicken pieces, four muffins, four rice, four regular sides, gravy, and the customers’ choice of drink for only P730.00 or for pure OMG Unfried Fried chicken goodness, there’s the 8-piece also ideal for sharing (P465.00).